A University of Hawaii astronomer has captured the first direct image of a planet forming around a star. Dubbed LkCa 15 b, it is the youngest planet ever found. The university’s Institute for Astronomy said Adam Kraus used telescopes on Mauna Kea island to find the planet. He was working with Michael Ireland from Macquarie University and the Australian Astronomical Observatory. LkCa 15 b is 450 light years away from Earth and being built by dust and gas. Scientists had not been able to see such young planets before because their parent solar systems’ light outshines them. Krause and Ireland used mirrors to cancel out the starlight and were able to see discs of dust near the planet. The astronomers used 10-metre Keck telescopes to reveal the forming planet sitting inside a wide gap between the young parent star and the outer disc of glowing dust. Kraus presented the discovery at Nasa’s Goddard Space Flight Centre on Wednesday after his research paper on the discovery with Ireland was accepted by the Astrophysical Journal. The optical sleight of hand used by the astronomers combined the telescope’s “adaptive optics” with a technique called aperture mask interferometry: using a a deformable mirror to rapidly correct for atmospheric distortions to starlight. It involves placing a small mask with several holes in the path of the light collected and concentrated by a giant telescope, and using it to manipulate the light waves. “It’s like we have an array of small mirrors,” Kraus said. “We can manipulate the light and cancel out distortions.” The technique allows the astronomers to remove the bright light of stars. 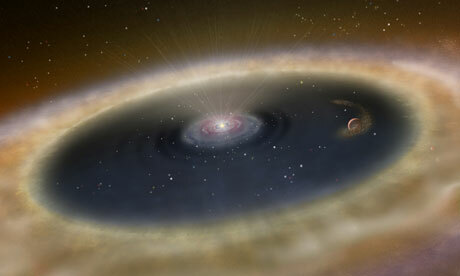 They can then resolve discs of dust around stars and see gaps in the dusty layers where protoplanets may be hiding. Kraus and Ireland plan to continue their planet search around nearby young stars. This entry was posted in ASTRONOMY, ASTROPHYSICS and tagged LkCa 15, Planets. Bookmark the permalink. If you think LkCa15b was a find…….keep looking, because zEpI^1 awaits U………………..